You are currently browsing the tag archive for the ‘1949’ tag. 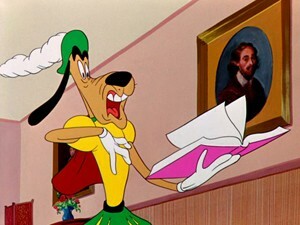 Robert McKimson reuses the Goofy Gophers from the Art Davis cartoons ‘Goofy Gophers’ (1947) and ‘Two Gophers from Texas’ (1948) to play them against an anonymous dog who wants to be a Shakespearean actor. The dog finds the gophers in his house, where they start to nag him for no reason. The humor comes from the Shakespeare quotes and the apt practical jokes the Gophers play on the dog, echoing his lines. However, it’s the opening scene that is the most remarkable part of the film: directly after the opening titles we watch the dog being hit by a pie, only to get the ‘That’s All Folks’ caption immediately after it. Then we watch the dog leaving ‘the stage’, cartoons and broad comedy in general to follow his Shakespearean dreams. This scene anticipates a similar scene in ‘Who Framed Roger Rabbit?‘ (1988). It’s a pity that the rest of the cartoon doesn’t live up to this great opening, and that McKimson didn’t use a more familiar or appealing character than this dog, which ultimately fails to impress. Robert McKimson would return to the Gophers only once, in 1958, with ‘Gopher Broke’. ‘Hippety Hopper’ introduces the kangaroo of the same name, and its only function during its entire career: being mistaken for a mouse. The cartoon starts gloomily enough, with a misty harbor scene, where a mouse is trying to commit suicide. 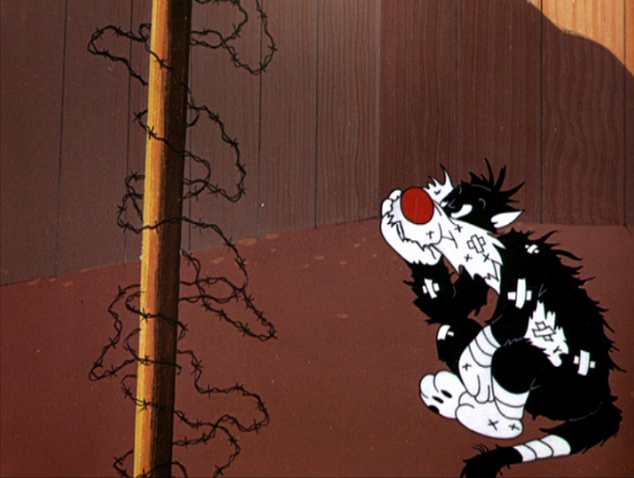 He’s rescued by Hippety Hopper, however, and together they face the mouse’s terror: Sylvester the cat. The mouse makes Sylvester think he can grow tall, and lets Hippety Hopper beat him out of the house. The best comedy comes from a bulldog who keeps pushing Sylvester back inside. Hippety Hopper himself is a silent character with a friendly smile and absolutely no personality. He’s easily the least funny recurring star in the Warner Brothers cartoon catalog before the 1960s. Even in this first cartoon his appearance is tiresome. Nevertheless, he would star in twelve other cartoons, lasting even till 1964. The mouse, on the other hand, would disappear after this cartoon. No wonder: he’s designed and animated rather uglily. 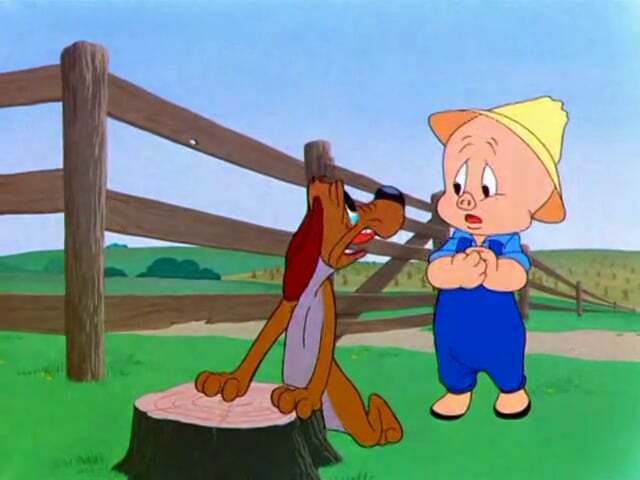 ‘Often an Orphan’ is the third of four cartoons featuring Chuck Jones’s minor cartoon star Charlie Dog. Of the quartet, this short is probably the best. Left alone at the roadside, Charlie Dog tries to become Porky Pig’s dog again, who now is a farmer in the countryside. At no point Porky is willing to take him in, despite some great acting by the deceitful mutt: highlight of the film is his playing of a weak, sick, nervous wreck, ruined by the terrors of the big city. This is arguably Charlie Dog’s all time best moment. The cartoon ends at the roadside, again, but now it’s Porky who gets left behind. 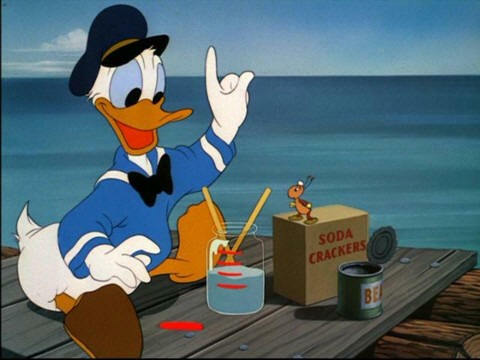 In 1949 Donald Duck had to deal with three small adversaries: Bootle Beetle, the bee and Chip ‘n Dale. Of the three, Chip ‘n Dale were by far the funniest – and it’s no wonder they have become famous where the two insects have not. ‘Toy Tinkers’ is particularly inspired, using Christmas toys as props for a chase inside Donald’s living room, leading to an open war that is far removed from the Christmas spirit. 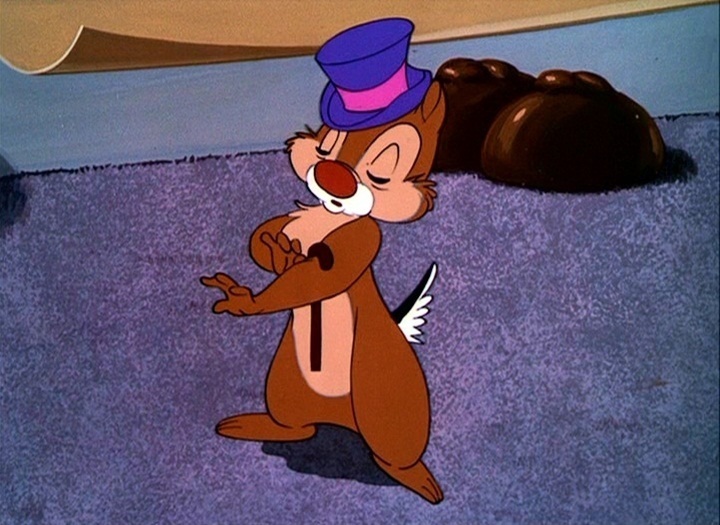 Highlight, however, is the excellent animation of Dale impersonating a gentleman with a top hat and a cane. After his move into the Donald Duck series three months earlier in ‘Honey Harvester’, the bee returns. This time as a classical music lover competing with Donald over the radio. While the bee wants to listen to classical music, Donald wants to listen to a world series baseball match. The most inspired gags involve Donald and the bee reenacting the match in Donald’s garden. But the bee is hardly a funnier character than Bootle Beetle, and the cartoon never comes off: the violence remains restrained, the bee remains cute. Donald is reduced to a simply annoying character, a bully who is rightly ‘sent to the showers’. ‘The Greener Yard’ is the third cartoon starring the annoyingly unfunny Bootle Beetle. In this short there are in fact two Bootle Beetles: an older one and his son, who doesn’t like to eat beans and who longs for greener pastures. But the older Bootle Beetle tells him how the grass always looks greener at the other side, but isn’t. He apparently has learned this lesson in Donald’s garden, where is given a hard time by Donald, his chickens and two bluebirds. ‘The Greener Yard’ is slow, boring and moralistic, and forms a low point in Donald Duck’s canon. 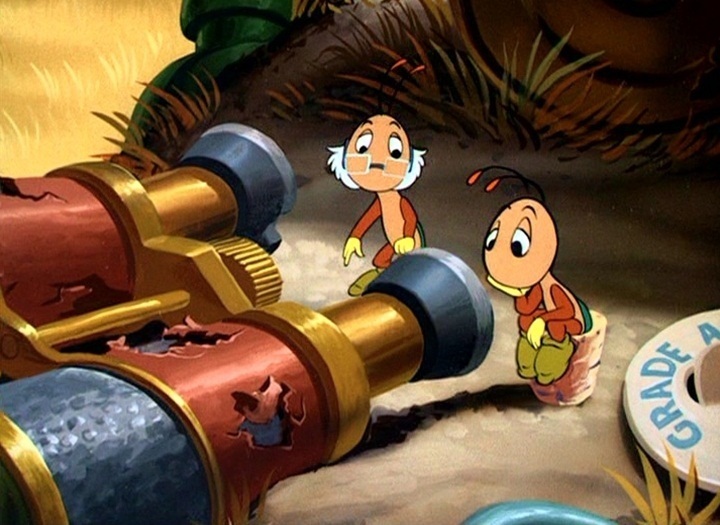 Luckily, it was the last Donald Duck short to feature this boring insect. Nevertheless, the elderly Bootle Beetle and his younger counterpart would return to the screen one last time, in ‘Morris, the Midget Moose‘ (1950). ‘Señor Droopy’ is one of Tex Avery’s most classic cartoons and arguably the best bullfight cartoon of all time, another candidate being Chuck Jones’s ‘Bully for Bugs’ from 1953. ‘Señor Droopy’ is set in Mexico and features the wolf as an overconfident champion bullfighter and Droopy as his measly challenger. 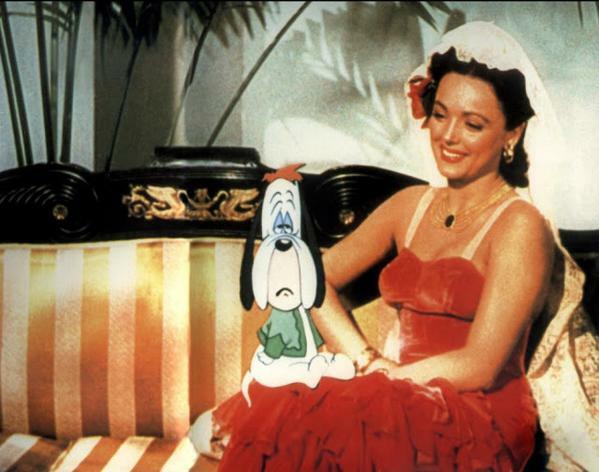 Both are in love with Mexican film star/singer Lina Romay, but it’s of course Droopy who wins her: the last scene shows live action footage of this forgotten film star petting our happy hero. But it’s of course not the story that makes the short so memorable. It’s the gags, and they come in fast and plenty. The film is stuffed with Avery’s own weird logics and cosmic laws, which lead to many a hilarious situation. The best example of Avery’s unique logic may be the following gag: when the bull has vanished between two wooden doors, the wolf closes them together, then another time, but this time vertically, reducing their size by two. He continues doing so until the large doors have been reduced to a tiny cube. He then casually throws the cube behind him, which quickly unfolds to the size of the original doors, which open to reveal a stairway to a cellar, from which the bull rushes back into the arena. Seeing is believing. ‘Señor Droopy’ is not entirely flawless: the wolf’s transformation from über-confident to panic-stricken is not really convincing, and Avery reuses the road gag from ‘Wild and Woolfy‘ (1945), which makes less sense inside the arena. But who cares! The interplay between the wolf, the bull and Droopy is delightful throughout, and even a minor character like the Mexican announcer is animated with gusto. It’s 7 October, and Chip and Dale are storing acorns for the winter. Because they don’t get enough, they steal them from Donald Duck, who, as a forest ranger, has a sackful to plant new oak trees with. 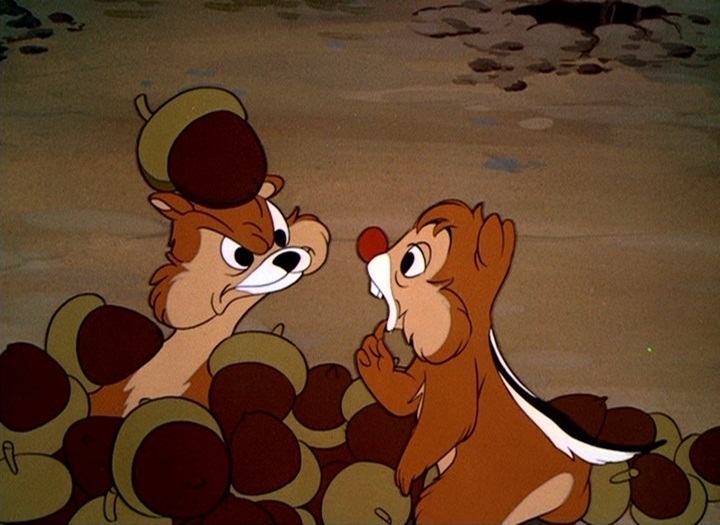 ‘Winter Storage’ was Chip and Dale’s fourth film, and only the second in their mature form. In this cartoon they are even better developed than in their previous entry, ‘Three for Breakfast’ (1948), and watching the interplay between the two chipmunks is a sheer delight. Donald’s role, on the other hand, is modest, and only comes alive in the finale, in a very nice fake ice hockey scene. Bootle Beetle, introduced in ‘Bootle Beetle‘ from 1947, returns to tell us about his relationship with ‘the captain’, and old seafaring version of Donald Duck. He relates how he and ‘the captain’ were shipwrecked and stranded on a desert island. Bootle Beetle never was a funny character, and this cartoon, too, suffers: Bootle beetle is simply too cute. Moreover, his relationship to Donald is never explained, nor the fact why Donald is suddenly a captain. To make things worse, the cartoon is painstakingly slow. 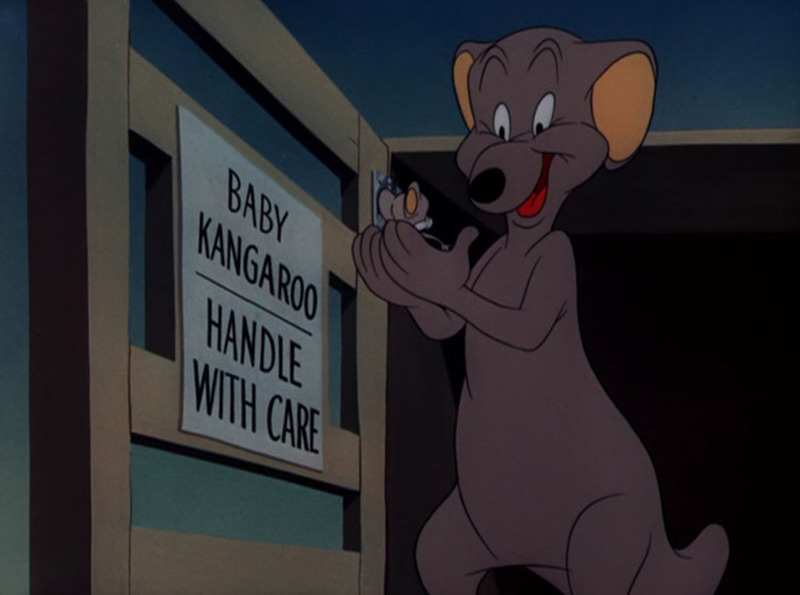 For example, it contains a very long gag on a coconut, unfavorably reminiscent of the overlong gags of the earliest character animation-based cartoons of the mid-1930’s, like ‘Mickey Plays Papa‘ (1934) or ‘Moving Day‘ (1936). ‘Story of the Bass Cello’ is a re-telling of a classic story by Anton Chekhov. The film tells about a bass player and a girl who both take a swim, but whose clothes are stolen. The bass player invites the lady to take place in his bass case, but when he’s after the possible thief, the case is picked up by his fellow instrumentalists and brought to the palace, where an astonished crowd discovers the naked lady inside. ‘Story of the Bass Cello’ is a mildly amusing and sweet film. It contains nice silent comedy. The short is a little bit slow, however, and not as good as Trnka’s more outrageous ‘The Song of the Prairie‘ from the same year. With ‘The Song of the prairie’ Trnka’s both made a parody of and a homage to the classic Western. The film uses all the cliches of the genre: a stagecoach, masked bandits, a damsel in distress, a hero with a white hat, a villain fancying the girl, and a climax on a cliff. Trnka’s animation has much improved since ‘The Emperor’s Nightingale‘: the cinematography is excellent, and particularly the illusion of speed is astonishing. The film is wonderfully tongue-in-cheek and full of brilliant silent comedy, showing Trnka’s then unsurpassed mastery in stop-motion. ‘The Song of the Prairie’ is one of Trnka’s most enjoyable films, and deserves a more classic status. The film tells about Mr. Wolf, a rich American, who is fed up with weapons and war. He retreats with his unwilling family to a peaceful island. But then oil is discovered on the island. Immediately, Mr. Wolf and his family are overpowered by greed, and the American only too gladly drops his pacifism. ‘Mr Wolf’ is based on a comedy by Evgeny Petrov. Although drowned in caricature, this blatant propaganda film is hardly funny: its animation is elaborate, but painstakingly slow, and too excessive. Moreover, it is not too clear what the message is. Are all Westerners blinded by greed? Is pacifism senseless in a world of war? Are oil and peace at odds with eachother? I’ve no idea. 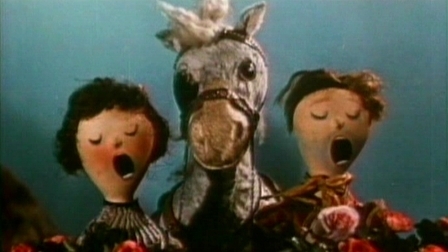 ‘The Emperor’s Nightingale’ is Jiří Trnka’s second feature film (he made no less than six in total). It tells the familiar story by Hans Christian Andersen from an original perspective: he frames the fairy tale by a live-action story about a lonely rich boy, who lives in a restricted environment. When the boy goes to bed, he dreams the fairy-tale, which stars some of his toys. Thus, after more than seven minutes, the animation kicks in. 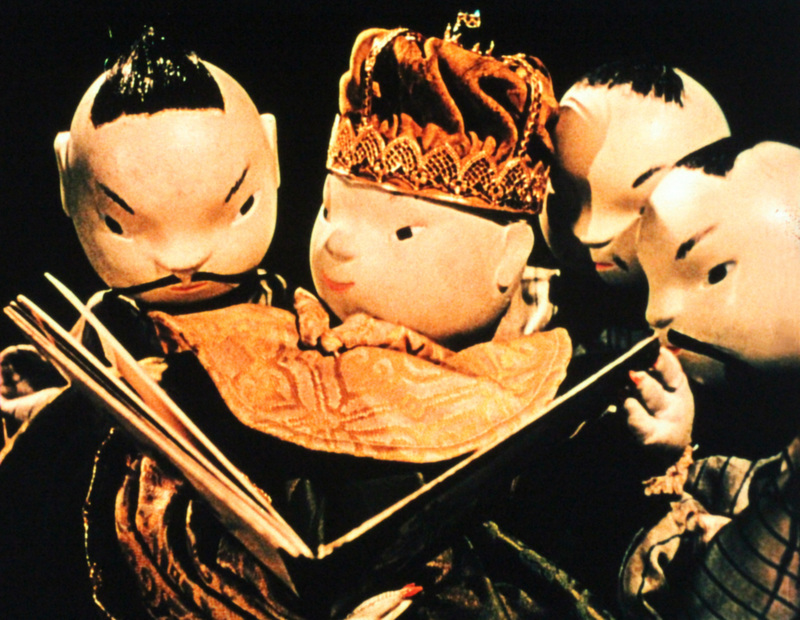 In the boy’s dream, the Chinese emperor is a lonely little rich boy, restricted by rules, too, and the whole film seems a plea for freedom and against rules and restrictions, quite some message in communist Czechoslovakia. This theme is enhanced by the English narration, wonderfully voiced by Boris Karloff, which is a welcome addition to Trnka’s silent comedy. The whole film breathes a kind of surrealistic atmosphere and Trnka’s use of camera angles is astonishing, as is his sometimes very avant-garde montage. 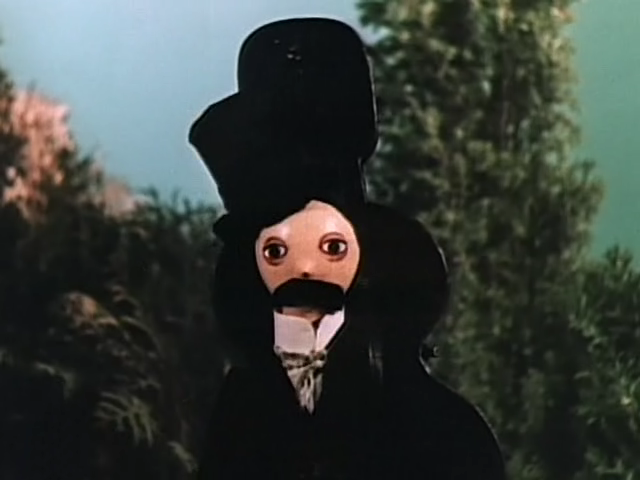 Nevertheless, the pacing of the film is slow, its humor sparse and only mildly amusing, and the puppet animation still too stiff to allow elaborate character animation. Therefore, the film hasn’t aged very well, and although a tour-de- force, ‘The Emperor’s Nightingale’ falls short as a timeless masterpiece. ‘Bad Ol’ Putty Tat’ is only the third of the Tweety and Sylvester shorts, but it already feels routine. The short opens with Tweety’s birdhouse all wrapped in barbed wire and a wrecked Sylvester sitting below, thinking how to reach the bird. 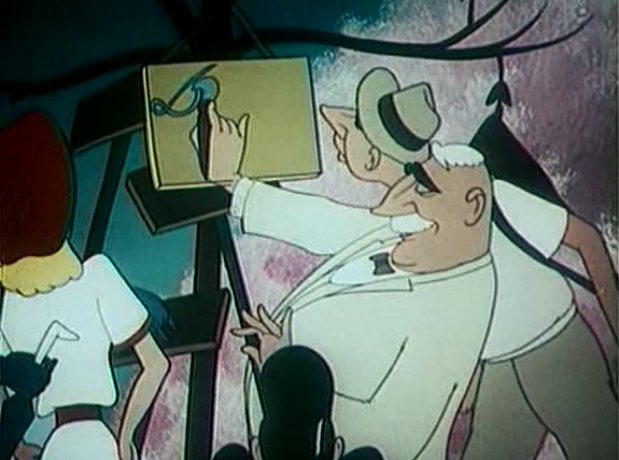 Friz Freleng and his team waste no time and immediately start with Sylvester’s attempts in blackout gags involving a fake female bird and a badminton game. 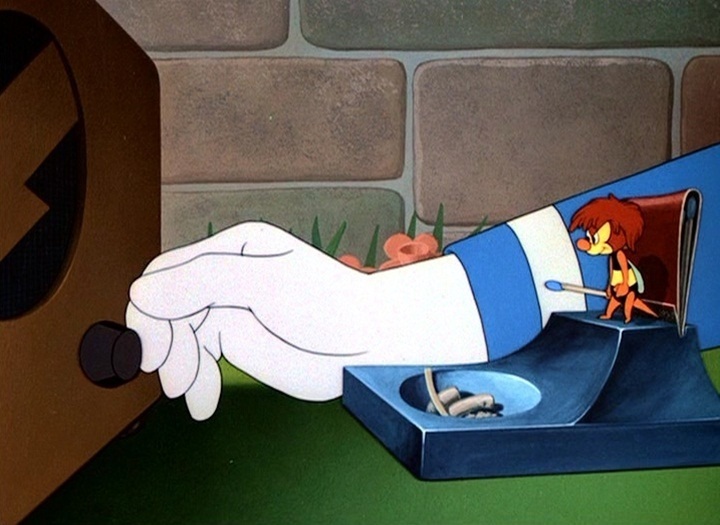 In this short Sylvester does manage to swallow Tweety, but the little bird takes control of his head, steering the cat like a train into a stone wall. In this short Goofy orders some home training devices to improve his condition. All his attempts fail, of course, sometimes in surprisingly long and elaborate gags, involving great situation comedy. It’s this cartoon Roger Rabbit watches in the cinema in ‘Who Framed Roger Rabbit?‘ from 1988. 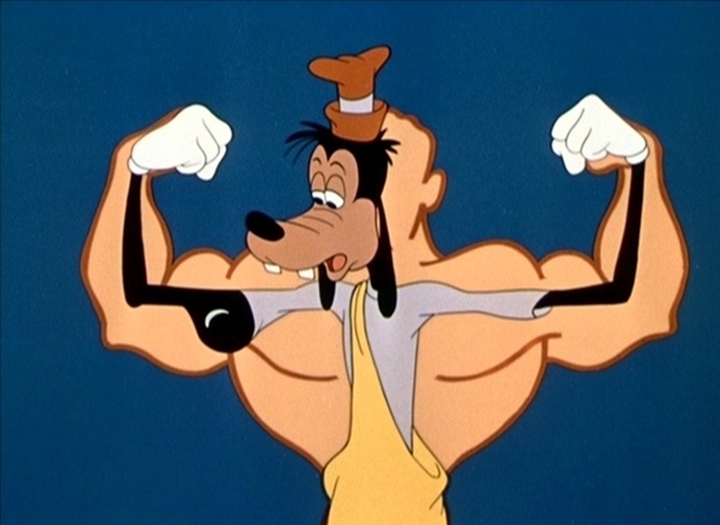 Together with the previous ‘Tennis Racquet‘, Goofy Gymnastics’ is a transitional Goofy cartoon: it’s the first cartoon showing the restyled Goofy as an average American citizen. Unlike ‘Tennis Racquet’, however, there’s only one Goofy in this cartoon, who even sings his own theme song ‘The world owes me a living’ again. ‘Goofy Gymnastics’ marks the last time we see Goofy in his original hat, which he only puts on after changing into his gym costume. It’s also the last of the Goofy sports cartoons. The next year, the same tired Goofy is advised to get a hobby, in ‘Hold That Pose‘. Like the earlier great sports cartoons it uses a posh voice over, who’s completely out of tune with Goofy’s antics with his home training gear. The action is a bit slow, however, and the animators make no attempts to synchronize their character’s lip movements with the now obligate Goofy vocalizations. After four years of working on feature films, Jack Kinney returns as a director of Goofy shorts to remain Goofy’s sole director until the series’ end in 1953. 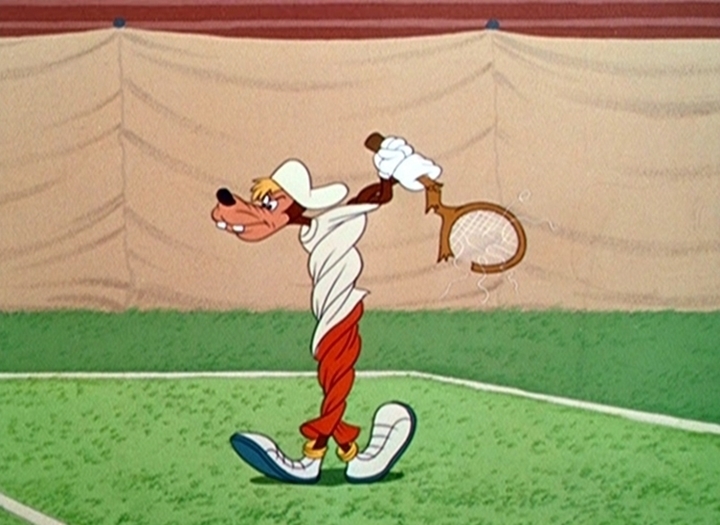 Kinney’s first Goofy film in four years, ‘Tennis Racquet’ is a transitional film: together with the next Goofy short, ‘Goofy Gymnastics‘, it’s firmly rooted in the 1940s Goofy tradition, being a sports cartoon, similar in content to ‘How to Play Football‘ (1944) and ‘Hockey Homicide‘ (1945). Moreover, in the first scene we hear one of the Goofy characters (the cartoon contains several of them) singing Goofy’s own theme song “the world owes me a living”, and in the end we can hear the typical Goofy yell, introduced in ‘The Art of Skiing‘ (1941). The short even features a slow motion gag, not seen since ‘How to swim‘ (1942). On the other hand, it can also be seen as the first entry of Goofy’s second series, for the character has been completely redesigned. The next year this new, redesigned Goofy would turn into Mr. Geef, the everyman. Like ‘How to Play Football’ and ‘Hockey Homicide’, ‘Tennis Racquet’ has no educational value: the cartoon consists of one frantic tennis match between two Goofy characters. It’s a fast and funny cartoon, full of silly gags. The highlight may be the running gag of the stoic gardener, who enters the game at several points, undisturbed by the frantic action around him. Tom and Meathead are having a tennis match, first against each other, then against Jerry. There’s no fair play involved, however, as all rules are broken, including the laws of nature. 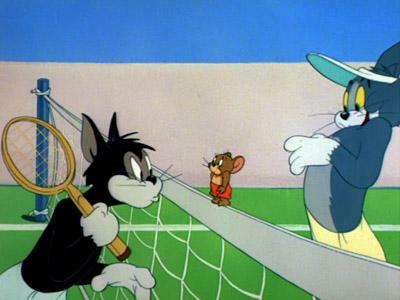 ‘Tennis Chumps’ is one of the most violent of all Tom & Jerry cartoons, and none of the three protagonists is sympathetic in it. It’s perhaps because of this that the humor of ‘Tennis Chumps’ never comes off, despite its fast timing and abundance of Tex Averyan gags. The inspiration of the subject of ‘Tennis Chumps’ may have come from the otherwise very different Goofy short ‘Tennis Racquet‘ from four months earlier. 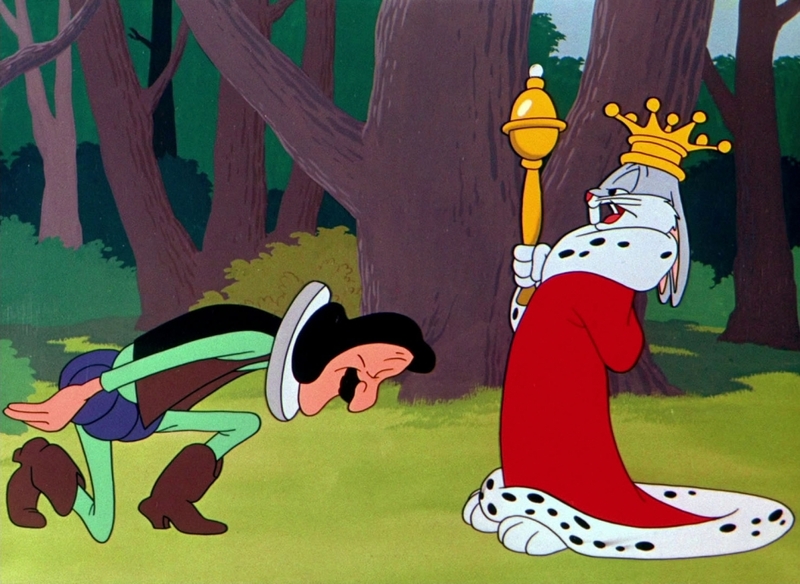 We’re suddenly in medieval England, where Bugs Bunny tries to “poach” one of the king’s carrots and is arrested by the Sheriff of Nottingham. This leads to several very funny encounters between Bugs and the Sheriff. The action is at times interrupted by a particularly dopey Little John who repeatedly announces the coming of Robin Hood. When Robin Hood finally does arrive, he appears to be Errol Flynn (live action footage from the 1938 feature ‘The Adventures of Robin Hood’ ). The best gag however, is when Bugs sells the King’s Royal garden to the sheriff as the perfect site to build a house. The poor sheriff only discovers he’s fooled after he has built half the house. It’s gags like these which make ‘Rabbit Hood’ an unassuming and probably underrated highlight in the Bugs Bunny catalog. To the previous Bugs Bunny cartoon: Which is Witch? 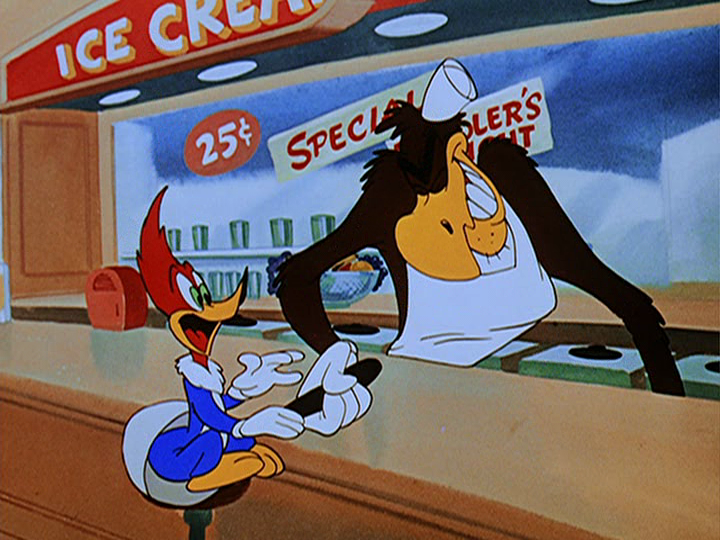 In ‘Mississippi Hare’ Bugs Bunny accidentally ends up at a Mississippi steamer, where he encounters colonel Shuffle, a small moustached Southerner who resembles Friz Freleng’s Yosemite Sam a lot. Like Yosemite Sam, the colonel keeps taking the plunge, in an excellent series of gags. Bugs Bunny is particularly suave in this cartoon, and so are the backgrounds. 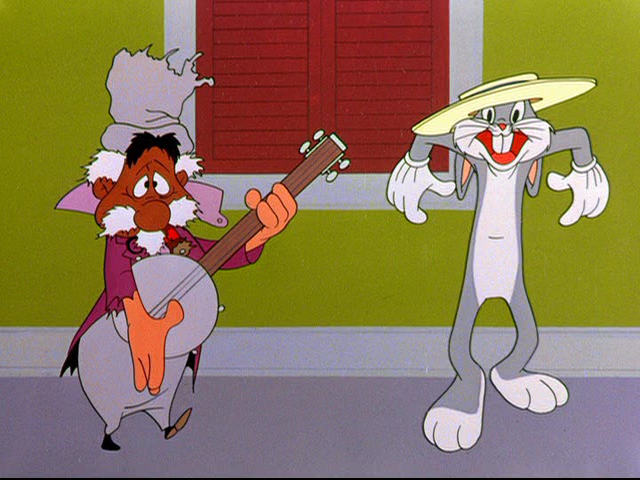 But the highlight of the cartoon may be the superb and intoxicating animation of Bugs Bunny dancing with a straw hat. The colonel would return to the screen the next year in the Charlie Dog cartoon ‘Dog Gone South’.